Jaguar overhauls XF and XK ranges | What Car? 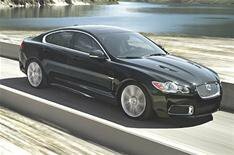 Jaguar has introduced extensively revised versions of the XK and XF ranges at the Detroit motor show. Both are set to go on sale in the spring and feature new engines, gearbox and chassis changes, along with some styling revisions. There are also two new versions of the XF, including a high-performance XFR. Both ranges get Jaguar's the new 5.0-litre V8 engines that replace the former 4.2 V8s, and the XF also receives the new 3.0-litre V6 diesels in place of the old 2.7 unit. The engines produce more power and torque than those they replace, yet bring down fuel consumption and emissions. In the XF, the diesel lowers company car tax ratings by four bands. The XFR is powered by a 505bhp supercharged V8 engine that also slots into the revised XKR. It is identifiable by its lower and wider front end, bonnet louvres, sill extensions, rear bumper valance and boot spoiler, all running on 20-inch 'R' wheels. It also has special leather-trimmed seats, plus dark oak and dark mesh aluminium dashboard cappings. There are also different dials to other XFs. It is joined in the range by a new super-luxury Portfolio model with heated and cooled front seats, suede headlining, plush carpet mats and optional ebony veneer trim. All XFs have new door mirrors, a device to prevent misfuelling on diesels and an acoustic laminated windscreen. Drivers will also get turn-by-turn navigation instructions that will be displayed in the instrument cluster. The six-speed ZF automatic gearbox in the XK and XF ranges has had to be beefed up to cope with the higher torque levels of the new engines, and there are improvements to chassis, brakes and electronic safety systems. The XK gets the rotary gear selector from the XF. Both 'R' models have firmer suspension and quicker steering than the rest of their respective ranges. The new cars also receive an electronic differential to improve agility and stability, plus electronic 'adaptive' suspension to improve body control and give the cars a more sporting character. XK styling revisions include new bumpers, side mirrors, rear lamps and chrome detailing, while cabin changes introduce heated and cooled seats. There is also improved door trim and a more luxurious look to the switches, instruments and headlining, too. Diesel XF prices start at the same level as the old 2.7-litre models. Jaguar will announce how much it will charge for the V8s, including the XFR and revised XK range, later.